A churchgoer holds a copy of the Catholic Mirror newspaper showing a photograph of Pope Francis, after mass outside the Holy Family Minor Basilica in downtown Nairobi, Kenya, Nov. 22, 2015. 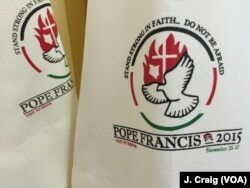 Streets have been newly paved, banners hung by the highways, and Pope Francis branded merchandise is for sale. All to welcome the pontiff when he kicks off his Africa tour Wednesday in Kenya. Kennedy Agesa is a tailor living in the Nairobi slum of Kangemi, one of the stops on Pope Francis’ itinerary. “We heard the rumors pope is coming, we were very happy,” said Agesa. Advocating for the poor has been a key tenet of Pope Francis’ papacy. In his native Argentina, he was referred to as a bishop of the slums. Father Simon Peter Kamomoe is a priest at Nairobi’s Holy Family Minor Basilica. He says the pope is the right person to speak about poverty. “Many Kenyans, a good number of Kenyans, are going through difficulties, so when they see the Holy Father now, living a very simple life, he is now identifying, identifying with the poor, with the people who are suffering,” said Kamomoe. On a more practical level, many residents of Kangemi slum, like Susan Waithera, are pleased because the high-level visit means the government has improved their security and road infrastructure. “By the way, he has done a very good job according to our road constructions, and some very many improvements,” said Waithera. Pope Francis is scheduled to speak with young Kenyans during his trip, and if this visit is like previous ones, he will likely urge them to work together, dream big, and above all, have hope. Kangemi resident Luke Kariuki thinks this message will resonate with young people. “Some youths will be welcome to the church, some will change their lifestyles, those who have been abusing drugs, they will change,” said Kariuki. The pope will likely address climate change, having previously said the underprivileged are disproportionately affected. Catholic Relief Services Kenya and Somalia country representative Lane Bunkers says climate change is particularly harmful to those whose livelihoods are dependent upon agriculture. “Where the weather patterns change significantly, where we have these extreme seasons of drought or seasons of heavy rains, this has an impact on the small holder farmer,” said Bunkers. Officially branded alb to be presented to priests, bishops, and other church officials during Pope Francis's upcoming visit to Nairobi, Kenya, Nov. 12, 2015. Pope Francis is also set to meet with different faith leaders, an important gesture in a country that has experienced its share of inter-religious and inter-ethnic violence. “Because the pope addresses humanity, you know. Not just the Christians,” said Kamomoe. But along the way, Pope Francis may find that he picks up a few new converts, like Agesa, who says he is currently a pagan. “Maybe when I will see him, I will change,” said Agesa. The pope spends three days in Kenya before leaving for his next destination, Uganda, on November 27.